Deliverables for Phase I of the State Aviation System Plan - the framework of the Plan - are complete and ready for review. The Public Comment Period is open now through May 10th. This is your chance to comment on our last two years of work! We are in the process of updating Minnesota's State Aviation System Plan. The SASP sets goals for the aviation system, identifies aviation needs, and creates a direction for the future. Give us your input on the SASP. Download the 2019 Airport Directory and Travel Guide or order a paper copy. View the 2017-2018 Aeronautical Chart. The Fly Minnesota Airports Program is sponsored by MnDOT Aeronautics and MCOA to promote general aviation in Minnesota. and their communities called Adopt-An-Airport. Any public-use airport in Minnesota is eligible to participate in the program. Learn more about airports closure. The annual Minnesota Airports Conference features experts in aviation and aerospace fields sharing their experiences in general assembly presentations, workshops, and open forums. Keynote speaker: Minnesota Vikings player, Harrison Smith! The 2019 banquet speaker will be Greg Herrick, owner of the Golden Wings Museum and MSPA member. Greg has a unique passion for seaplanes and vintage aircraft. One of the big reasons that MSPA has been able continue growing the events that take place at the safety seminar is the generous support of our sponsors. Contact Madden's Reservation Desk at 800-642-5363 to reserve your room, register for the seminar and select your meal plan. Registration forms will be available in the near future! You can even renew your membership at the above link! 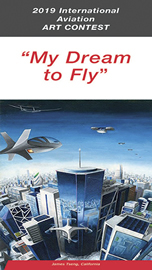 This year theme is "My Dream to Fly." See the 2019 Minnesota Aviation Art Contest winners.